The Genting Casino Coventry Blaze can confirm that player/assistant-coach Brett Robinson will not return to the club for a fourth season. Now 33-years-old, the recent Father departs after 195 total games, during which he registered an impressive 203 points (68 goals + 135 assists). He ranks 13th in all-time points, and 10th in all-time Coventry assists. He is one of only 14 players to have recorded over 200 points for the club. Of those 195 total games, 178 came in Elite League competitions where he scored 59 goals, 125 assists for 184 points. He ranks 8th in all-time points, and 7th in all-time assists for Coventry in EIHL competitions. 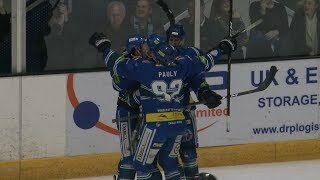 The Alton, Ontario, Canada native is one of only 9 players to have scored more than 50 goals, and assisted more than 100 for Coventry in EIHL competitions. He is the 10th quickest player of all-time to reach 100 points for Blaze in the Elite League. His debut year came in 2015 where he led the club for point and goal scoring, being named Coach’s Player of the Year. After the devastation of injury on the first shift of the playoff final, Robinson returned for a second year, again going on to lead the squad for points and assists. This past campaign, with 51 helpers, Robinson beat his past previous best (45) in all Coventry games, again leading the team. 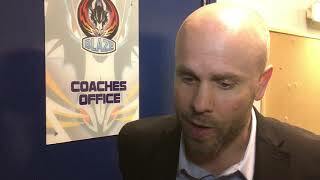 Before joining Blaze, the number 23 played over 340 games in the East Coast Hockey League, scoring the Kelly Cup clinching goal with Cincinatti Cyclones in 2009/10.